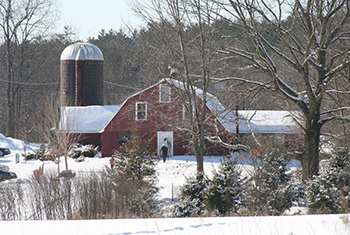 Great Brook's trailhead lodge is a renovated cow barn heated by wood stoves. In addition to the ticket counter and rental area, this rustic building provides space for skiers to tie their boots and prepare for a tour of the trails. Picnic tables located inside and outside the lodge offer a place to rest after skiing, have a bite to eat, and enjoy a view of nearby ski trails and farm fields. Visitors can bring their own picnic or stop at the snack bar to find hot and cold drinks, instant soup, candy, granola bars, etc. Ski waxes and other items can be purchased at the sales counter. No changing rooms or lockers are available. All cars must be out of the parking lot at closing time.